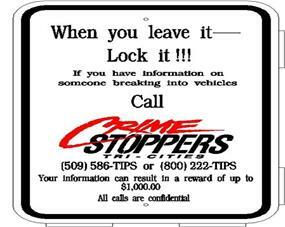 Did you know that 50% of the time when a vehicle is stolen in Kennewick it is either left unlocked; with the keys or left running unattended? 50% of the time a home is broken into, it is left unlocked or doors and window are left open. 50% of the time when a vehicle is broken into and items taken, it is left unsecured. Remember- When you leave it, lock it. It just takes a moment and it may keep your property safe. Check out the Crime Prevention page for more helpful tips. ⇐Previous KPD Citizen's AcademyNext⇒ Did You Know?